I think I’ve mentioned before on this site that I have a thing for Greek wines. My conviction is that they’re the next big thing as a trend on the wine market. Or maybe they already are, since I’m not a professional market watcher. At least they amaze me, sometimes in practice with the actual pleasure I have in my glass, but sometimes just in theory with the huge potential this wine country has to offer with its climate, its diversity of terroirs and its richness of autochthon varieties. One thing though I haven’t had confirmed yet concerning Greek wines is their ability to age which is an important criterion describing the “greatness” of a wine region in general. Think of Bordeaux’ and Burgundies: the whole fame of those regions is built on mythic wines from great vintages which are evolving over decades. When I try to remember the oldest Greek wine I had until today I think of something like 3 years of age. 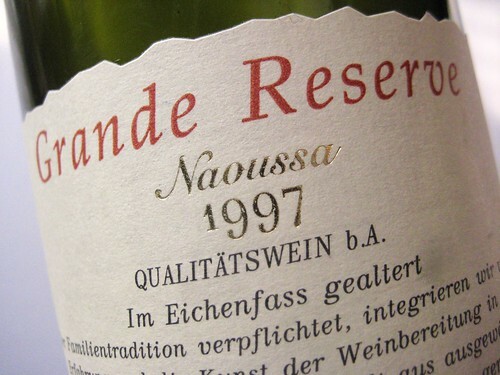 But this was to change since I recently came across a bottle of 1997 Boutari Grande Résèrve from Naoussa. But before we go further lets have some elucidation about Boutari. Those of you who already encountered Greek wines might say: Boutari? This Greek supermarket wine? And in fact, to call Boutari a big winery nearly is a huge understatement. Not only is Boutari the biggest wine producer in Greece but also on a global scale it can be compared to companies like Mondavi or Gallo. And indeed, many of its wines can be found on supermarket shelves within Greece. Lame!? Not necessarly. Offering mass produced supermarket wines might have a negative connotation, but one thing is sure, with offering those basic Greek wines, Boutari plays a great role in educating the world in Greek wines and Varieties, showcasing their quality, their diversity and their potential. Thus it’s the flagship of the Greek wine industry in general and deserves merit. Further I am convinced that Boutaris’ inexpensive wines beat many of the equivalent brands we can find on our European supermarket shelves. But Boutari of course not only stands for mass produced supermarket wines. In several wineries they produce superior wines, employing all the techniques a top notch European winery would. In the Naoussa region for example, where Boutari played a pioneer role for the wine industry, the winery produces a Grande Résèrve of Xinomavro wine, which is the bottle I came across in a food store. So let’s verify. I opened the bottle and poured a glass without decanting. The colour was dark red, but getting lighter to the sides which already revealed an aged wine. Nothing wrong with that – just a regular attribute of maturity. The nose was a bit closed from the start, but then again I really didn’t give it lots of time to aerate. Later light fruit notes appeared as well as hints of liquorice and anise. With some time the barrel ageing was also detectable, but far away from an unpleasant wood tone. It actually just got better and better … but suddenly the bottle was empty. I wonder how a little decant would suit that wine? For the palate though the wine didn’t seem to need long airing. It immediately showed nice blackberry fruit and liquorice. The structure was dense and loose at the same time. Tannins are still present but aren’t too harsh, they’re rather fine and giving a little grip, thus adding to the structure of the wine without being loud. The alcohol content of 13% isn’t surprisingly high for such a Southern wine region but still solid. It didn’t though appear in any bothering way and seemed to be well integrated. Finally A touch of acidity put everything in balance for obtaining a good wine: everything is there, nothing appears overdone. Later, the fruit developed with notes of cooked plums, and the finish showed a sweet maltiness and further liquorice notes fading into a entirely satisfying length. Great! This was a very enjoyable bottle clearly showing that there is ageing potential with Greek wines (Knew it ;)!) from the Naoussa region. Regarding the style of the wine, although I read that Xinomavro wines have been compared mostly to Burgundies and Rhône wines, I found that this one reminded me a bit more the Spanish Duero type of wine, although Rhône would basically also work as an analogy for me. But it has this dark fruits and dense kind of structure common to Ribeiros and actually I really would want to have it as a pirate in a Blind Tasting one day and see how it’s perceived. Ja, es gibt da ein paar tolle Tropfen in Griechenland. Ab und zu präsentieren die griech. Winzer ihre Weine in Berlin . Ich hab übrigens heute vor eine Flasche 2005 “Trilogia” zu köpfen. Das Bordeaux-Schnäppchen aus Griechenland……..
Ja Trilogia ist ein toller Tropfen, er kam mir zuletzt aber noch way too young vor. Den Boutaris muß ich dir aber unbedingt ans herz legen, bei dem preis fast schon pflicht mal zu probieren ( 9 Euro im Laden – hab diesen Jahrgang im internet aber nicht gefunden ). Wie war der Trilogia also, würd mich interessieren. Kommt bestimmt bald was auf dem blog oder?